See the cover of the brand new Diary of a Wimpy Kid book, The Meltdown! It’s here! Late last week we were teasing the brand new Diary of a Wimpy Kid book, showing you loads of photos of it covered in snow. Well, telly superstars Sam and Mark popped onto Facebook to try and free the new cover, which was trapped in this huge block of ice! 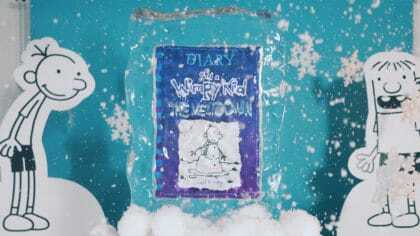 They melted, chipped and blasted the block of snow covered ice to reveal the cover hidden inside – the new Diary of a Wimpy Kid book! When a wintry blast closes Greg Heffley’s middle school, it turns his neighbourhood into a battleground, complete with snow forts, alliances, betrayals, and epic snowball fights. Obviously it’s called Meltdown and it comes out on October 30th 2018! Click here to pre-order the book! The book comes out on October 30th 2018, so make sure you pre-order the book so you don’t miss out! Playing: carried away by h.e.r.